Shoulder Impingement | Podiatry Associates, P.C. The dog’s barking, the kids are crying, you’re late for practice, and that work project is hanging over your head. There are a lot of things that can weigh you down. In fact, if you live an active, busy life, you’ve probably felt like Atlas at times, with the weight of the world on your shoulders. Stress, along with sports, aging, and repetitive motions can result in shoulder pain. Fortunately, at Castle Pines Physical Therapy, we can help you shrug it off! Your shoulder is made up of a lot of different parts including joints, tendons, and muscles. It follows, then, that this complex part of your body is vulnerable to a variety of problems. Two of the most common are shoulder bursitis and shoulder impingement, otherwise known as rotator cuff tendonitis. Shoulder Bursitis—Bursae are tiny fluid-filled sacs that act as buffers between the tendons and bones in our bodies. Sometimes these sacs can become inflamed, causing pain when you move. There may be swelling and tenderness in the affected area as well. This condition is often accompanied by tendonitis, an inflammation of the tendons adjacent to the bursa. A pinching pain is a sign of impingement. Shoulder Impingement—Raising your arm can force the bone on top of your shoulder to rub against, or impinge upon, the tendon and bursa. Over time, the friction causes pain and irritation. Those who repetitively raise their arms are most at risk. Examples includes swimmers, baseball and tennis players, construction workers, painters, and wallpaper hangers. Initial symptoms are ignored frequently, as pain tends to start out mild and progress with continued use of the shoulder. Eventually, pain may radiate into the arm and be present at rest, not just when moving. You will gradually lose strength and mobility, and may even have difficulty performing minor actions like pulling up a zipper or buttoning your shirt. A trip to the doctor can determine the cause of your shoulder pain and the necessary treatment to relieve it. In most cases, conservative treatment options are enough to reduce pain and restore function. Rest is at the top of the list. Refrain from lifting your arm or participating in activities that cause pain to the area. Anti-inflammatory medications will help relieve discomfort and keep swelling to a minimum. Occasionally, the inflamed bursae may have to be drained with a needle and syringe. Once pain subsides, physical therapy will help you regain strength and mobility. Stretching exercises will loosen stiff muscles and tight tendons, as well as improve range of motion. Cortisone injections are also an effective option if pain persists. In some cases, surgery may be necessary to remove the inflamed bursa or damaged tissues. This procedure is most commonly done arthroscopically. 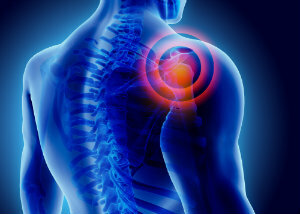 Once healed, you can gradually return to your activities, taking care to not overuse the shoulder. Be sure to take frequent breaks from repetitive motions. If you’ve undergone surgery, you will likely have a sling for a period of time. Full recovery depends on the extent of your problem and can take anywhere from two to four months, to a full year. Dr. Jennifer Molner of Castle Pines Physical Therapy can help move along the healing process. If shoulder pain is weighing you down, call (303) 805-5156 to make an appointment, or visit us at our Castle Pines, CO, location. You can find us on Facebook too.